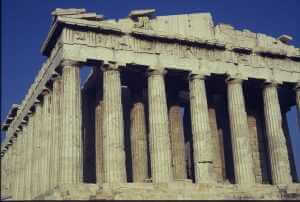 5th-CENTURY ATHENS LAID THE FOUNDATION OF THE MODERN WORLD. In Antigone and the Greek World students explore the play and this foundation together, bringing both Antigone and the period into sharp focus, each shedding light on the other. 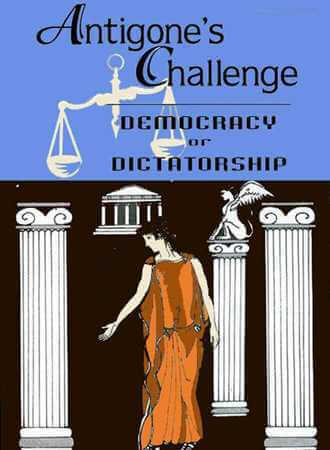 For example, students investigate and answer challenging questions such as: how does Antigone’s behavior reflect the struggle between autocracy and democracy in 5th-century Greece and in similar political tug-of-wars today? How do Antigone’s attitudes and actions differ from traditional women of the period and from contemporary women? 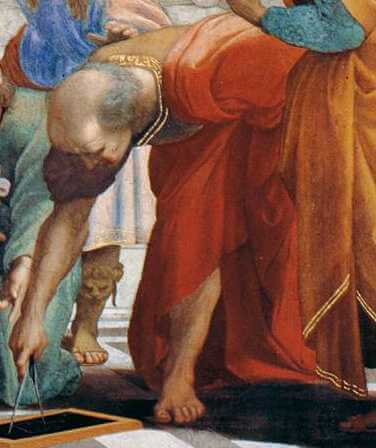 What are the similarities and differences between Ancient Greek governments and modern governments? Students also explore the birth of democracy and the causes of the Peloponnesian War; they learn how Greek theater evolved and the roles of the chorus, music and dance in Attic drama. 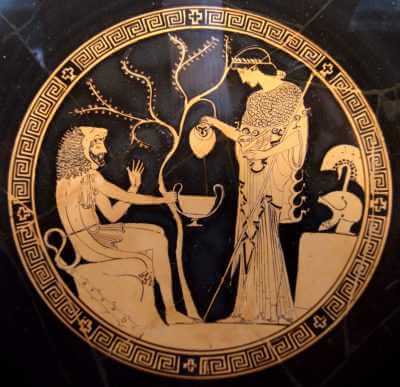 They read Greek art that employs visual metaphor and mirrors Greek drama, transcribe Ancient Greek music, choreograph a scene in the play, and trace and emulate Archimedes’ discovery process. Each of the exciting and highly engaging chapters in Antigone and Greek World is Common Core aligned. Independent Antigone vs. authoritarian Creon, and Antigone’s courage and strength compared to her sister Ismene’s submissiveness. The theater offered lessons in politics and in the complexities of administering justice and behaving justly in society. 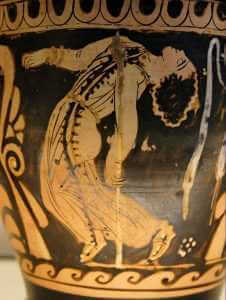 Students learn to read Greek art that mirrors Greek drama and uses visual metaphors, symbols and contrasts. 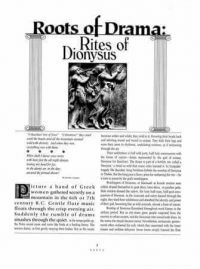 This chapter satisfies CCSS.ELA-LITERACY.CCRA.R.7 (Integrate and evaluate content presented in diverse media and formats, including visually and quantitatively, as well as in words) and CCSS.ELA-LITERACY.RL.9-10.7 (Analyze the representation of a subject or a key scene in two different artistic mediums, including what is emphasized or absent in each treatment). 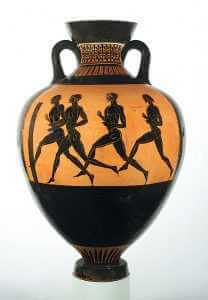 The evolving techniques of Greek vase painting. 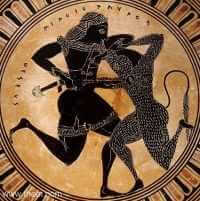 Students investigate the evolution of drama from Dionysian rituals to the trilogies of Aeschylus, Sophocles and Euripides. 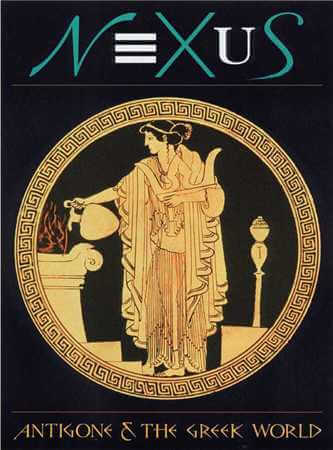 All NEXUS chapters are embroidered with colorful period anecdotes and resonant links to students’ interests. We believe that if students’ emotions are not engaged in the learning process, they will distract them from it. NEXUS motivates students to make an emotional investment in their own education. This chapter is aligned with CCSS.ELA-LITERACY.RL.1 and RL.2 (for 9-10 and 11-12). 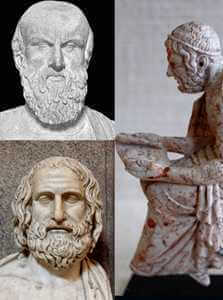 Students investigate the evolution of the Greek gods, from Homer’s pantheon to Sophocles’. 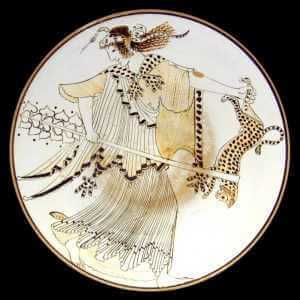 As the Greeks matured, so did their view of their gods. In this chapter students also learn why oracles, prophets and bird signs were so much a part of the Greek world and their plays. Students delve into Archimedes’discovery process, including how he discovered pi. This chapter is aligned with CCSS.ELA-LITERACY.RST.2, RST.3, RST.4, RST.8, RST.9 [for 9-10 and 11-12] and with the Common Core goal of exercising literacy across the curriculum. 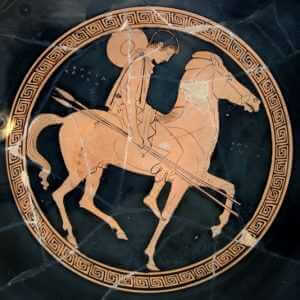 Students transcribe ancient Greek music into modern notation, and learn the role of music and rhythm in Greek drama, and the role of Greek instruments in poetry, plays, and athletic events. SStudents investigate the different styles and preoccupations of Athens’ three greatest tragedians, Aeschylus, Sophocles, and Euripides. Each playwright viewed man’s relationship with the gods and state differently. 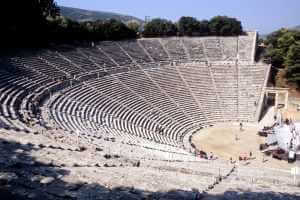 Providing students with a brief but global perspective of the evolution of Greek drama enables them to fully grasp Antigone’s place in Greek theater. This supplement is aligned with CCSS.ELA-LITERACY.RL.6 (for 9-10 and 11-12). 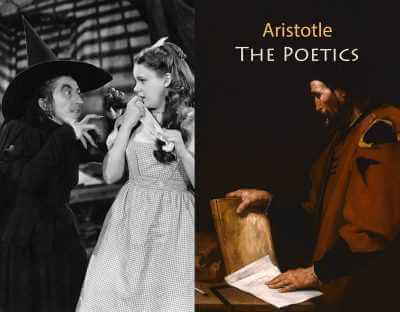 Students learn to apply key rules of Aristotle’s Poetics, such as the Law of Necessity, to their skits, plays, and short stories by using a very familiar and easy-to-understand model of dramatic structure and characterization, The Wizard of Oz. 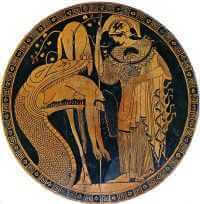 The external and internal obstacles that obstruct Dorothy and Antigone serve as models for students’ own dramatic works. This creative writing exercise with its straightforward and fun analytic components are aligned with Common Core Standards CCSS.ELA-LITERACY.RL.2, RL.3 and RL.5 (for 9-10 and 11-12). This supplement expands upon the chapter “The History of 5th-century Greece” in Antigone and the Greek World. 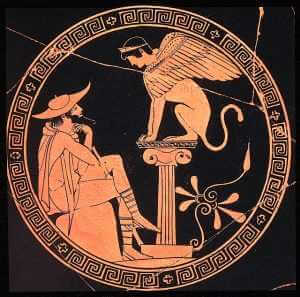 In Ancient Greece soaring too high – hubris – was viewed as the prelude to an Icarus-like fall. Athens’ aggression against its reluctant ally Melos and its subsequent unprovoked invasion of Sicily was partly driven by hubris. Students consider the various points of view 5th-century Athenian leaders as they debate whether to invade Sicily or not. This supplement satisfies Common Core History Standards CCSS.ELA-LITERACY.RH.2, RH.3 and RH.9 (for 9-10 and 11-12). 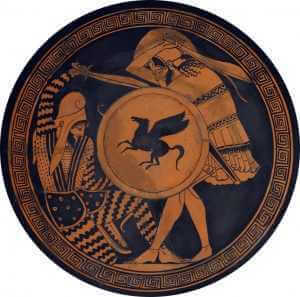 Euripides wrote his great anti-war play as a censure for the unprovoked Athenian attack on Melos (they massacred all the males and enslaved the women, much like what the Greeks did at Troy) and a warning not to attack Sicily. Without being required to read the play, students explore key passages of The Trojan Women and compare them to quotations from Edith Hamilton’s preface to her translation of the tragedy. 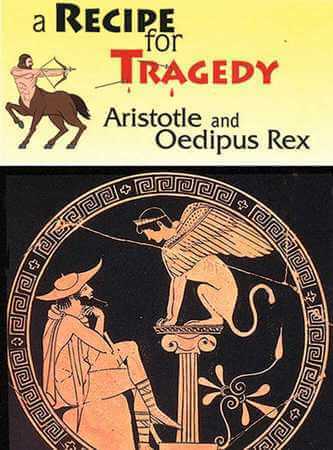 This supplement builds upon “The Three Kings of Tragedy” and “Athens’ Hubris: The Turning Point of the Peloponnesian War” and meets Common Core Standards CCSS.ELA-LITERACY.RL.1, RL.2, RL.3, RL.4, and RL.5 (for 9-10 and 11-12). Students learn the role of choral dance in Greek drama and choreograph a dance for the “Ode on Man” in Antigone by balancing a sequence of mimetic gestures like we see on some Greek vases, while being attentive to the Greek love of symmetry in the strophe and antistrophe. This supplement is aligned with five COMMON CORE STANDARDS: CCSS.ELA-LITERACY.RL.1, RL.2, RL.4, RL.5. and RL.7 (for 9-10 and 11-12). We use three devices (including a rock song) to help students not only grasp but appreciate what many argue is Keats’ greatest ode. 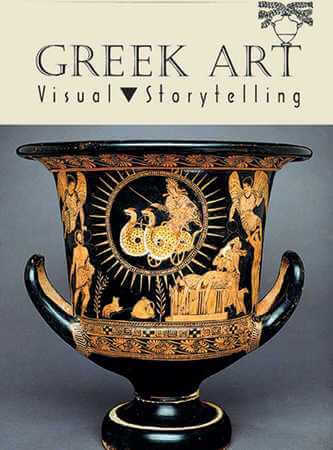 This exploration of Ode on a Grecian Urn reinforces what students learn about reading and interpreting the visual narrative and visual metaphors, contrasts, and symbols on Greek vases in “Greek Art: Visual Storytelling.” This supplement satisfies CCSS.ELA-LITERACY.RL.2, RL.4, RL.5, and RL.7 (for 9-10 and 11-12). 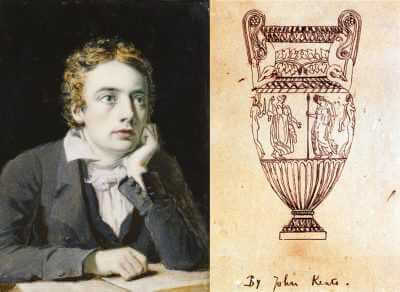 This supplement helps students understand Ode to Psyche by first exploring Keats’ belief in an evolution of refinement and self-awareness modeled on the progression of Greek gods from Chaos to crude Titans to the more refined Olympians and finally to Psyche, the goddess of the mind. 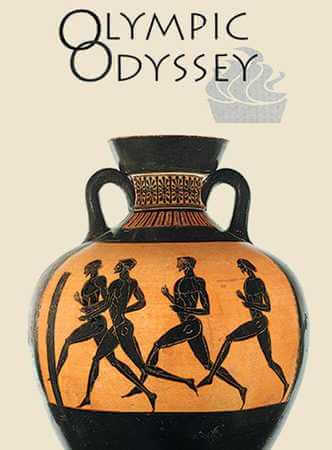 This supplement reinforces key sections of the chapter “Greek Myths and Modern Man” in Antigone and the Greek World and satisfies CCSS.ELA-LITERACY.RL.1, RL.2, RL.4, and RL.5 (for 9-10 and 11-12). GUIDELINES: The NEXUS guidelines suggest interdisciplinary activities and student-friendly ancillary readings. They also give teachers guidance in many key areas; for ex., we tell you exactly where to find Pericles’ three great speeches in Thucydides’ voluminous History, etc.